If you are using blogger default template you will see a navigation bar at top in your blogger blog. Some custom templates also allow this navbar. 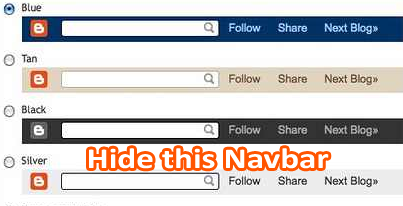 This navbar includes with Blog search box, Flag a blog, Next blog link, Create a blog and Sign in to blogger etc. This navbar is not apropos with a blog because it looks ugly and old designed and if you are a pro blogger or if you have a blogger blog with eye catching design it will destroy your good looking almost twenty percent. From my personal experience I can say many visitors even a blogger user does not use it at all. 9. Click Save Template and reload your blog homepage. That's all. It works. Thanks to your help.